Ask Dave Taylor – How Do I Use LinkedIn to Find a Job? Linked Intelligence – What Are Best Practices for a LinkedIn Job Search? Dennis Smith of WirelessJobs.com – Are You Using LinkedIn for Your Job Search? I hope you find some of these resources to be helpful, and once I’ve update my list for 2009, I’ll share those links with you too. Feel free to add any resources you would suggest that I include in the Comments section below. The list can only be better with your help! The top six social media tips to know before you leave the office. Last week, LinkedIn launched its new “follow” feature, which enables users to track a company from its profile page or the profile pages of its employees. This new functionality is a reminder that the professional social networking site is more than just a resource for job hunters. Now, LinkedIn’s 65 million members worldwide can monitor a company’s news, new hires, and special events, and marketers should take notice. The network’s business focus makes it a prime platform for demonstrating thought leadership, networking with potential leads, drawing attention to products or services, and engaging internal audiences. Furthermore, recent updates and rollouts have made it necessary to monitor the conversations about corporate brands taking place on the site. This week’s Six @ Six outlines six best practices every company should be implementing on this increasingly important social network platform. How is your company using LinkedIn to enhance its brand reputation and generate business leads? Let me know on Twitter @valerieelston. For some, this advice may seem exceedingly basic. Yet, a surprising number of businesses are not in control of their company’s profile on LinkedIn. Taking charge of the content available on LinkedIn is critical because the site ranks highly in search results and receives about 70 million visits a month. Additionally, it’s important that someone be assigned to manage the profile because any employee can edit the page. This will ensure content is correct and current. LinkedIn indicates the last person to have edited the profile so you will know if someone other than the profile manager has made changes. Be sure to brand your page with your company’s logo, add links to other online resources such as your company’s website, and choose to have your profile automatically populated with news items. These features will add depth to your profile and increase the content available for search engines to crawl and index. Because the amount of information one can add to a company profile is governed by LinkedIn’s pre-defined fields, it’s important to make the most of the space available. Take time to rewrite your company description from an SEO perspective. What are the keywords that drive people to your company’s website? These words should be liberally utilized in your company’s LinkedIn profile. Your employees can also take steps to optimize their profiles, which will enhance their credibility as brand ambassadors while also strengthening the company’s SEO. For example, when entering website information on your profile, you can add a description by selecting “other” from the drop down menu. This enables you to add keywords that will help search engines direct searchers to your links. The power of employee brand ambassadors cannot be underestimated. Employees are your brand’s first line of defense on LinkedIn and encouraging them to participate helps disseminate positive information about your company. Many of your employees may already be taking part in group discussions or using the Answers feature. Of course, these communications should be subject to internal checks before posting and all employees should be provided with best practices and instructions so they can most effectively leverage their personal profiles. Whether you want to create and manage a group or simply take part in an ongoing discussion, LinkedIn groups offer an easy way to network with industry peers around the world. Recommend that your employees join groups for your industry’s professional associations, local networks, or those devoted to interests in their field. Groups offer two key benefits. First, they provide opportunities for thought leadership where employees can post to discussions based on their own expertise. And second, they enable employees to share positive information about your brand from news articles, company blog posts, and other online sources. LinkedIn can potentially be a top driver of Web traffic when properly integrated. As your company likely does with Twitter and Facebook, prominently display a LinkedIn icon throughout your website. With the addition of the new “follow” feature, users can start following your company through your profile page, so encouraging them to click through to the site will increase the number of people who decide to join your network. Make sure you highlight LinkedIn on each social networking site your company engages as well – be it Twitter, Facebook, or YouTube. As was mentioned in Six @ Six a few weeks ago, LinkedIn’s Direct Ad capabilities enable advertisers to target audiences by criteria such as company size, job function, industry, position, and geography. The value of targeting your ads based on these criteria is immense and companies should also consider purchasing direct ads to enhance and protect brand reputation. LinkedIn ads can be connected to your company’s profile, therefore increasing your legitimacy and creating an additional opportunity for users to find out more about your company, products, services, and employees. Networking is a crucial component of any job search. And today's social-networking technology makes it easier than ever to network your way into the job of your dreams. Use these tips to ping, tweet, poke, and post your way into your dream job or a new career. 1. Get LinkedIn to various networks. A good rule of thumb for job searching is to make yourself visible and available. Traditionally, that means posting your resume on sites like Yahoo! HotJobs and making sure your friends and family know you're looking. But today, it's more than that. You need to become visible across the web. Establish your web presence in various avenues, so employers can find you. Create profiles on multiple social networking sites and even consider starting a blog about your trade. According to Paul Gillin, a social media marketing consultant and the author of "Secrets of Social Media Marketing," LinkedIn and Twitter are the two outlets you want to be sure to use as a job seeker. LinkedIn is the place to start, according to Gillin. "The reason for that is that LinkedIn is very targeted and very focused" he says. "It's got all the tools and it's got this unique, degrees-of-separation concept where you can find people by being introduced by a common link." Finding common connections through the LinkedIn tools is a great place to start networking for a new career. Secondly, Gillin gives high praise to Twitter as a job seeker's tool. "I recommend Twitter because it may be the fastest way to get in touch with someone you want to reach," Gillin says. "Anyone on Twitter can get a message to anyone else who is on Twitter." Gillin notes that finding an email address for a contact within a company can be a challenge. But locating someone on Twitter and sending him or her a quick note is relatively simple. And emails to potential employers tend to be formal and somewhat wordy--these long-form emails are often ignored. But, Gillin says, "because Twitter is so brief, people tend to respond quickly on Twitter." 2. Clean up your social-networking presence. Having a social-networking presence can be a great way to land your dream job. But it can also be a liability. Make sure your online appearance projects the image you want to share with potential employers. HR professionals and recruiters have gotten very good at finding ways around privacy limitations when investigating job candidates. Even if you think you have a private profile, use caution. "If you're going to share photos of yourself face down in a puddle of beer, you should choose to do that under a pseudonym," recommends Gillin. "Think of how you want to appear to the outside world." Your online personality is as important as your resume. Just as you would proofread a cover letter or resume before sending it, edit your Facebook profile, tweets, and blog posts with the same detail. "Spell checker is not sufficient for that task," Gillin says. "Before you publish anything online, have someone who knows the language read your website." And monitor your behavior online as well--that is, "avoid loose-cannon behavior," Gillin says. Posting overtly nasty or vindictive comments, incorrect facts, or anything that doesn't appear polished can hurt your chances. 3. Have a distinct message about yourself. Searching for a job is a marketing task--you are marketing yourself to a specific audience. And as with any good marketing plan, you need to develop the message that you want to get across. Define the message, and then figure out how to get that message heard. Find information that backs up the claims you make about yourself. "It could be your words, pictures of the work that you do, or evidence of your achievements," Gillin says. "Then you promote those. You use the various social-media tools to push that out." It's important to show employers what you've done. Post it on your Facebook page, tweet about it, etc. "12 Essential Tips for Success in Social Media," a marketing brief focused on how to effectively engage through social marketing, urges social networking participants to be honest. "One characteristic of social media is that people are more aggressive about reading between the lines to interpret other people's intentions. And they're remarkably savvy about it. ... If someone suspects you're in some way misrepresenting yourself, they'll use any of the tools available to investigate your past postings across the blogosphere to sniff out what you're really up to. It happens all the time, and it severely undercuts the credibility of anyone exposed as a shill. Whether you're launching your own social media site or just participating in discussions around the Web, be conspicuously honest and straightforward about who you are and whom you represent." Creating a Facebook profile about your accomplishments is a great tool, but only if you have actually achieved the success you post about. Present yourself to the Web professionally, thoughtfully, and honestly. 5. Participate in the conversation. Your personal web presence is incredibly important, but don't forget that your potential employer likely has its own presence as well. According to "12 Essential Tips," the key to building influence in your community is getting involved: "You need to participate in the conversation. If you've already identified the people influencing market dialog, comment on their blogs. Write posts that track back to their blog if they allow that. Write posts that engage or challenge them on a topic that matters. Go forth and get in the conversation; don't wait for it to come to you. To be successful, you need to continually engage and develop relationships through dialog with the influencers." Find blogs and forums within your industry and become a participant. It's possible that your future boss operates or participates alongside you. Your thoughtful comments within popular industry spaces online will bolster your credibility and improve your chances of landing your dream job. Looking for a new job, Alexa Scordato didn't email or call her contacts about possible openings. Instead, she messaged them via the social-networking Web site Twitter.com. Her brief message: "Hey there! Looking for a Social Media job up in Boston. Are you guys doing any entry level hires?" Within a week, she had an interview. Within two weeks, she had a job. The site, which lets users publish supershort updates of what they're doing, is a virtual meeting ground where a range of communities -- from moms to media professionals -- come to converse informally. It's been criticized as a site for sharing mundane details about everyday activities. But people like 22-year-old Ms. Scordato, who used Twitter to privately message some people she'd met at a conference, show the site can be more than that. "I would guess that if I had just sent them a long email with my résumé, I might not have gotten a response as fast as I did," says Ms. Scordato, who was hired by Mzinga, a Boston-area company that helps businesses use social technology. 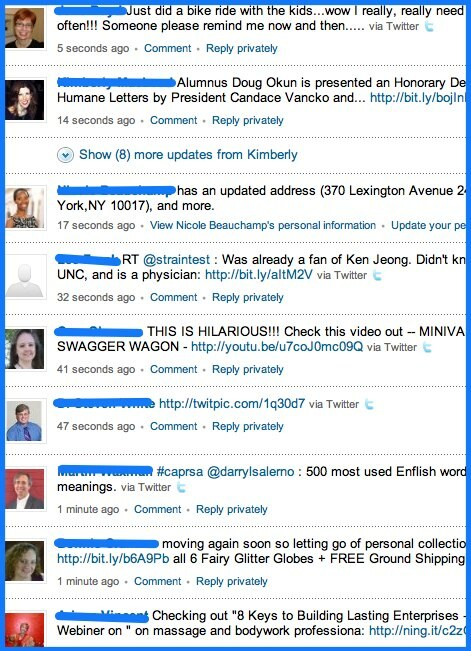 Users, known as Twitterers, post short updates that appear in their online profiles. They can choose to follow each other's updates, called tweets, and respond either publicly through posts or privately via direct message. All entries must be 140 characters or less. Twitter doesn't release user numbers, but most public estimates put the user base at around four million to five million, with about 30% or more being very new or limited users. To get started, build a profile that shows your interests and start Twittering. Because you have no more than 140 characters to describe yourself in your bio, use key words that reveal your goals. Make more information accessible by linking to your Web site, blog or profile on a professional networking site like LinkedIn. Amy Ziari, a 24-year-old looking for a public-relations job in San Francisco, links to her blog on her Twitter profile and lists her Twitter alias on her résumé to show recruiters she is "not a faceless résumé -- there's somebody behind it." You'll find major companies and recruiters on the site, and should follow the big names in your industry. Most users get emails alerting them about new followers, and may choose to follow you as well if your biography and tweets get their attention. Initiate conversations with other users by responding to their tweets. You can share updates you find useful by reposting them on your profile. Never twitter about anything you wouldn't want your boss or mother to see, and tell your friends to keep their tweets to you appropriate. Be careful about publicizing your job hunt on Twitter if you don't want your boss reading about it. But if you're unemployed, sending an occasional tweet that explains the kind of job you're looking for could yield responses from recruiters. You can also seek jobs being promoted on the site by searching for phrases like "job opening." Twittering about your personal life is fine, to an extent -- it's something most Twitterers do. But keep it to a minimum. "I would rather see someone who posts good-quality information than what they had for lunch," said Lindsay Olson, who uses Twitter to recruit for Paradigm Staffing, a staffing agency that focuses on public relations and marketing. Recruiting-technology firm Jobvite Wednesday unveiled Jobvite Share, a free tool that uses the power of social networking to distribute and target job openings to increase referrals and track in real-time the value of job placement ads. Using Jobvite Share, a company executive or human resources manager looking to fill a position enters a job URL and Jobvite creates a custom, trackable listing for the position, regardless of where it is distributed on the Internet. The job listing -- dubbed the Jobvite -- can automatically be sent to specific contacts within Facebook, LinkedIn, Twitter, email or elsewhere on the Web, and tracked using real-time metrics. “As we continue to see signs of an economic recovery, companies -- still strapped for resources -- can now recruit the best, closest fit, talent on the open social web for free using Jobvite Share,“ said Dan Finnigan, president and CEO of Jobvite. Prospective employers can share short Jobvite links through emails or via one or several social networking sites, blogs and job boards. The software uses an algorithm determine those potential candidates that best-meet the job qualifications. Recipients can pass along these messages to their connections, further expanding the prospective pool of candidates, according to Jobvite. Since Jobvite Share includes up to five trackable links, the employer can determine which sites are most effective for marketing and distributing job leads. These metrics monitor views, clicks, forwards, and clicks to apply, and track individual channels such as Twitter, Facebook, LinkedIn and e-mail. They also follow referrals as they spread across users' individual networks. Social networking sites continue to play a big role in uniting employers and prospective hires. TwitJobSearch.com, a job search engine for Twitter, posted 586,836 new jobs in the last 30 days and 694 new jobs between about 10 and 11 EDT today, according to the site. This is the third in a series of posts I have published on improving the SEO around your personal brand. In this post I wanted to share some tips on improving the SEO of your LinkedIn Profile. Before I start, I want to be clear that even if you follow these tips it is unlikely you will be screaming to the top of the Google search results. Having a blog that you update regularly is by far and away a more effective medium for improving your personal search rankings. However, if you are not that way inclined, or are already blogging, these things will not do you any harm and are worth trying out – even if it is just so you will have a completed LinkeIn profile. Complete your LinkedIn profile. Before doing anything else, make sure your LinkedIn profile is complete and up to date. There is absolutely no point in improving your search engine rank if the end destination does not represent you accurately. I wouldn’t go too overboard trying to game the system, but search engines do scan the information in your profile, so make sure you are including the keywords you want associated with your name. Customise your URL. You can customise the URL associated with your profile to include your name, rather than the random sequence of numbers LinkedIn generates for you. URLs are incredibly important component of SEO, so this is a no brainer. (learn how to do this by watching the video below tip 7). Pay special attention to your job title and location. Your location and job title are the only personalised pieces of information provided on a generic search for your name on LinkedIn. There is not often a lot of flexibility in job roles, but perhaps think about how you can present your title in the most effective way to include desired keywords. Include your entire job history. People may be looking for you by searching for previous companies you have worked for. If these are not included in your profile then you may not be found. This is particularly important for people with more common names. Specialities. Make sure you fill out all the sections. A particularly good section for including keywords is the Specialities section. Google does index this section, so make good use of it. Join related groups. There is an enormous value in joining LinkedIn groups beyond SEO. From an SEO perspective they help by associating the name of the group with your search profile. Search for Groups that are aligned with your professional interests. The Group names will typically include relevant keywords for you. Customise your links. Rather than the generic, blog, company website or Twitter links that LinkedIn generates you can customise your personal URLs to generate more potential Google Juice. This is a little bit involved, so check out this handy video created by Mike Volpe of HubSpot. Answer questions. I have heard it suggested that you can improve your search rankings by responding to questions on LinkedIn, thus creating link backs to your profile. I would imagine Google is clever enough to ignore this, but perhaps I am wrong? Irrespective, answering questions does raise your profile generally and is a good idea, so I have included. As I stated above by following these you are unlikely to dramatically shift your search engine rankings, but they won’t hurt. Well worth an hour or so of your time in my opinion. Lewis Howes is a former professional athlete, world record holder in football, and author of the LinkedIn book, LinkedWorking. He is the founder of the Sports Executives Association, and the popular sports and social media blog SportsNetworker.com. LinkedIn ( ) is one of the best places online to find a job, period. It’s also a great place to connect with top decision makers, generate targeted leads for your business, drive traffic to your website, and more. If someone is thinking about hiring you for a position, he or she is going run a Google ( ) search for your first and last name. For many, a LinkedIn profile will rank in the top five results. This gives you a certain level of control in showcasing your best talents with your profile. Make sure your profile is 100% complete, and position yourself as an expert in your niche. A profile that is only 55% complete, without recommendations and an updated work history may not make a solid first impression when people find you through search. Your headline is the first thing potential employers and hiring managers will see after your name. First impressions are an important aspect of the interview process, and this holds true for your LinkedIn profile as well. Be clear and to the point with your headline. Try to tell people who you are, what you do, and how you can help them in as few words as possible. This simple step will help you stand out from many other LinkedIn profiles. It’s important to include where you have worked in the past and where you are currently working. Obviously, the more work experience you can list, the better. You never know which position will earn you the respect of the hiring manager and give you the edge you need to land the job. There’s always a chance the hiring manager has worked at one of your previous companies, or has hired other professionals from that company. Situations like this may help you get the job security you are seeking. On your traditional resume, you are supposed to have a limited amount of recommendations. However, on your LinkedIn profile, the more people who can vouch for you, the better. If you only have two recommendations on LinkedIn, most people won’t take your profile seriously. It’s unfortunate, because there are a number of qualified and experienced professionals who aren’t active on the network. This can hurt their reputation. Remember, in the online world, perception is reality. If people believe that no one will recommend you because there are no visible signs of approval displayed on your profile, why would they want to hire you? The best way to receive recommendations is to give them first. The more you give on LinkedIn, the more you will receive. Take some time to write a few recommendations for those you know, like, and trust, and a majority of them will write you one in return. There are some on LinkedIn who believe you should only connect with a small percentage of professionals you know and trust. Others say (including myself) you should connect with everyone, even if you vaguely know them. When looking for a job, you never know who will be able to recommend you, or who is looking for someone to fill a position where you would be a perfect fit. When connecting with others, make sure you always send a personalized message. This doesn’t have to be an essay, but make sure you mention why you are connecting or how you know one another. Also ask if there is anything you can do to assist them. By offering your services to help, this breaks down any initial barriers and gives others another reason why they should hire you. In your headline give them the intro to who you are and what you are all about. Let people know who you are by injecting your personality into your work experiences, your summary, your specialties, and in how you help people. Finish up strong by adding in your honors, awards, personal websites and case studies. Provide a call to action on how to connect with you and ways to follow up if they want to learn more. I believe half the battle of finding a job is simply letting others know you are alive. There are so many resumes being submitted to open positions that it can be tough to break through sometimes. Luckily, LinkedIn works in your favor if you are active and constantly engage within the community. Each time you take action on LinkedIn, it shows up on the home page of everyone you are connected to. The more people see your picture, read you name, and check out the compelling content you are delivering, the more likely they are to think of you when a position opens up. Stay active, and the opportunities will be much more abundant than if you don’t participate at all. Groups are a great way to find a position because they have built-in job boards with new jobs being added on a regular basis. Some groups have tens of thousands of decision makers within them. As a member, you are able to send a message to almost every person without having to upgrade to a premium account. LinkedIn also has a great advanced search function, and once you find who you want to connect with, you can often message them directly through mutual groups without actually needing to be connected. Being a group owner has many advantages. It allows you to send messages once per week to all the members, and you are perceived more as a decision maker and thought leader. Start attracting potential employers as opposed to seeking them out all of the time. Including honors and awards is just another way to increase your value to potential hiring managers. Employers want to hire winners, and those who know how to excel. Be sure to show them what you are made of, and post everything relevant to your success in your past work history. This is a great way for job seekers to showcase their talents and expertise and stand out from the crowd. It’s also valuable to entrepreneurs and business owners for gathering leads. Add the ‘Answers’ widget on the right-hand side of your LinkedIn home page with the industry topic you know the most about. When you see a question pop up that you can answer, make sure you give your two cents and provide as much information and value in your answers as possible. The more you give to and serve others, the more job opportunities will come your way. There are a number of ways to beef up your LinkedIn profile and make its content more compelling. Adding your blog and Twitter ( ) account is a good first step. Simply connect with your Twitter profile and check the box to make sure your tweets are syndicated to LinkedIn. This will save time and make it look like you are more active on LinkedIn as well. Adding your blog to your LinkedIn profile is a no-brainer. This not only drives organic traffic back to your site, but showcases your regular activities and expertise. I’m a big fan of connecting people. Whenever I see someone with a certain career need, I try to think of the right people I can introduce them to. I want to create a mutually beneficial gain for each party. The more I do this, the more career opportunities come my way. When you help two people without asking for anything in return, you leave a lasting impression on all involved. This will help amplify your own job prospects, as people will be more likely to help you achieve your goals in the future. Don’t get discouraged if you don’t immediately see results. Effectively building your LinkedIn presence and online network won’t happen overnight. Remember these tips, and start to actively engage. Take action, be consistent, and you’ll soon be exploring a wealth of new professional networking opportunities. Are you hurting your business relationships by syncing Twitter and LinkedIn? Quick Update: Chris Brogan just posted his tips on using LinkedIn effectively. Sheds light on best practices he follows, some of which I’ve outlined below. Read more on Chris’ blog. 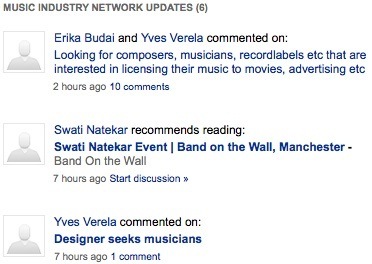 And, here’s another on how to use LinkedIn status updates. Priceless. I noticed my good friend, Chris Brogan, seems to have come down with a case of Twitter overkill, on LinkedIn. Let me explain. Recently, we started letting our users sync up their LinkedIn and Twitter accounts. That lets you stream your status updates from LinkedIn to Twitter and vice-versa. You do have the option to selectively update your LinkedIn account with only those tweets tagged #in or you could let the whole fire-hose of your twitter imagination run riot on LinkedIn. Would you take your vacation pictures and paste it in your cubicle. No, you wouldn’t. So, why does it seem ok to let in your entire twitter stream directly to LinkedIn. That said, I’m sure you’d love to show off a picture of you standing next to a business celebrity you may have stumbled upon and paparazzi’d while on vacation. The problem with these auto twitter streams is that folks like Chris start seeing a relentless twitter stream when they log into their LI homepage. Of course, this is dependent on the # of friends you’re connected to on LinkedIn, as well as how twitter friendly they are. In Chris’ case, since he’s both a best selling author and marketing expert he probably has a ton of connection invites (most of which he accepts – more on that later) who also have a lot to say on Twitter. Unfortunately, some of them chose to stream all that Twitter to their LinkedIn accounts. As Chris recommends, go to your LinkedIn-Twitter sync Accounts and Settings and turn down the Twitter faucet. Secondly, make sure the tweets you bring in to your professional LinkedIn ecosystem are hashtagged #in and have a business context. vs. the random LOST tweet that popped in to my LinkedIn stream today. Secondly, increase the quality of your connections (keeping it business) and spring clean your LinkedIn accounts every once in a while. Many times when I see persistent, random tweets come in from people I don’t very well recognize I use that as an opportunity to weed out the connections that may have sprung up inconsequentially. When you see someone spam you with their tweets, all you’ve to do is mouseover the right of each status update, which will pop up the HIDE button. Click on that and you won’t receive updates from that user no more. You can also do this on your Facebook feed, if you’ve a noisy friend, for e.g. For a more granular control of the updates you see on the homepage, click through to this Update Settings page where you can then tweak updates by either connections or Type. Let’s not forget, LinkedIn is a business focused networking site, so letting in all your tweets – all personal and business – will have the exact opposite effect you were hoping to achieve by using the site. And, by that, I mean it’d end up hurting the same business relationships you were hoping to nurture. Plus, be thoughtful while you send out those LinkedIn connection invites. My rule of thumb is to invite folks I’ve met a few times, talked to and who can recognize my personalized invite right away. What is yours? Now that you’re no longer that noisy neighbor everyone’s calling the cops on. Learn how to use your LinkedIn-Twitter sync to maximum effect for your business. Time your relevant, most impressive tweets or status updates for maximum effect. By that I mean scheduled updates at the most effective timings. Here are some tips on what’s the best time to tweet. There are a slew of services that allow you to tweet information to select services. Three that come to mind – Tweetdeck, Hootsuite, and Seesmic – all of which allow scheduling your tweets. Tweetdeck’s new update in particular has me wowed since it allows me to not only shorten and track the effectiveness of links through my bit.ly account, but it also let’s me schedule tweets across LinkedIn, Facebook, and Twitter. One last tip: If you’re a small business owner or the social media manager who runs your company’s official Twitter account (like I do here), I’d recommend tying that to your Twitter account. If your company does not have a Twitter account but you’d still like to share the latest happening at your company with your LinkedIn network, then consider adding your company’s blog to LinkedIn. More on that here. These tips are just the beginning. I’ll continue to blog on ways you can use social media effectively at work and for your business, right here on this blog. Please consider subscribing to my blog or following me on Twitter. A candidate recently asked me, “How do I find a hiring manager in a large company like Microsoft?” There are a lot of ways to do this but one of the easiest and best is using LinkedIn. When I recommended this to the candidate he completely agreed, however, the problem was he only had about 60 connections. Too few to be effective. So often I speak with candidates that just don’t understand the value of LinkedIn as a job search tool. We constantly are sent invitations to join someone’s network only to find after months of searching they are just now starting build a LinkedIn network. You should consider building your LinkedIn networking all the time. NOT JUST WHEN IN A JOB SEARCH. People can find you. The more people at the second and third degrees of separation the more times you will show up in a search. For example, I have around 500 contacts. However, I am linked to over 5 million people on LinkedIn. When I search for a candidate that is a huge database. LinkedIn will eliminate the need for resume databases on Ladders, Monster, Careerbuilder and other job boards. This is because it costs on average between 5,000 and 10,000 dollars to have access to these resume databases. LinkedIn is free. Why would a recruiter or any company pay that when we can use LinkedIn for free. Resumes databases by the job boards are not pick up by Google or any search engine. These are the ones you want to make sure you show up on. LinkedIn is and you can even improve your search results for as little as $25 a month. (See prior blog article SEO Your Search On Google) It helps you find the people you want an introduction to. This is very powerful. I have helped numerous people with introductions as a result of LinkedIn. On a weekly basis I receive requests indicating they found a person in my connections and would I make an introduction. I always agree. Even when working this is a great tool for resources, customer contacts and introductions, references, service providers and even potential hires for you or your company. On a personal basis it is a great way to stay in-touch with friends, colleagues, prior employees and networking contacts. When you update your profile they will get a notice and likewise when they update theirs. Work hard at building your connections. Make every effort to reach that magic 500+. If you use Outlook download the LinkedIn tool bar. It makes inviting people very easy. There are many more positives to building your LinkedIn network than there are negatives. Many have resisted. I believe this recession has proven to be good thing for everyone’s network. If you have other ideas share them by adding a comment. Lets help everyone build a strong network. A good way to start is building a network is making sure your profile is complete. If it isn’t start there and then begin expanding your contacts. Don’t miss the opportunity to get a high ranking on Google. You can download for free our “8 Matrix LinkedIn Profile Assessment” tool. Our complete job search home study course the, “Career Success Factor Methodology” is a comprehensive resource that covers all 5 steps in an effective job search. You can review the complete system for just $14.95. We will even pay the shipping and to ensure your success include in a copy of our job search workbook. To review the Career Success Factor Methodology CLICK HERE. One of the reasons why so many people get frustrated searching for a new job is that they spend all their time on the job boards. While posting for jobs online is one method of search, it's what everyone else is doing too. And it's hard to get noticed when you are one of hundreds of candidates vying for the same position. More people find their jobs through the hidden job market; the jobs that are not posted to the masses, but are uncovered through research and relationship building. No, I'm not talking about pity eating and downing a bag of chips and a pint of ice cream in front of the TV. But meeting a friend for coffee, a drink, or lunch is a great way to combine something pleasant and fun with some power networking. Meeting with friends keeps you top of mind and increases the likelihood of them recommending you to others. Journaling is a great way to record how you are feeling during your search and examine the trends that could be indicators of what is working in your search and what is not. Some even turn their journals into blogs to create a following and make new friends and contacts as they chronicle their unemployment experience. Did you know that The Department of Labor funds job training programs? You may qualify for training in a specific skill or funding to return to school to complete a degree program. And an advanced degree or certification may make you more marketable in the long run. Aerobic conditioning and weight workouts can help you feel better and burn calories more efficiently during the day. Pilates can help reduce the muscle aches often associated with hours of sitting at a desk hunched over a computer, and many people find that a regular yoga practice is a great way to reduce stress. Plus an exercise class or gym can serve as a great affinity group and connector to people who may be able to make valuable introductions for you. 6. Do Someone a Favor. When you were working you probably didn't have the time to watch someone else's kids or pet or help someone with a home improvement project. Now that you have some free time, offer to help make someone's life easier. Your efforts will be remembered and that help may be reciprocated in the form of an important introduction or job lead. This is not an indulgence. The little details like your hair and nails count during a job search. And it can be rejuvenating to get a new hairstyle or experiment with a new nail color. I'm not suggesting a totally new wardrobe. But a new scarf, tie, hair piece, or handkerchief can change up the interview suit you are tired of wearing and give you a renewed sense of confidence. 9. Read. Books by Harvey Mackay and Keith Ferrazi have provided inspiration for millions of job seekers over the years. Check out some of their titles at your local library. 10. Reconnect. Get over your concerns about reconnecting with past colleagues and friends. Social media tools like LinkedIn and Facebook have made it fun, easy (and less creepy) to get back in touch with people from your past. Rekindle past relationships and you are bound to find a friend or two that can help you with some aspect of your search. 1. Edit Opportunity Preferences: Edit your profile and change your contact settings > Opportunity Preferences. Select Job Inquiries and any other opportunities you prefer. 2. Get Recommendations: More recommendations in your profile means that your profile gets a higher the trust and reliability. Send a request for recommendation to your co-workers, clients or immediate managers. If you are in a management position, it is great to get a feedback on your leadership qualities. Make a practice also to recommend others whom you think deserve. This is another way to get a feedback from them. 3. Find where the Opportunity Is: Search for people in similar job profiles and find out where they work. Search on Google about those companies and find out if there are openings. 4. Find out the skill sets required: After you find out the companies where similar profession people work, it’s good to find out the skill sets they posses. 5. Find out how your colleague got that nice offer: Not many colleagues share all that they know or all that they do to get a job. Search with their names on LinkedIn and find out their background. Where they are employed now, what are their roles and responsibilities and more importantly what are their skill sets. 6. Contact the HR: Did you finally trace out the company which is still hiring your kind of job? Great! Now, find out who among your network is working there. How are they linked to you? Are they a first degree contact or second or third? Get in touch with them through your friend or a person in your network and pass on your resume. Usually, a resume from a coworker is paid more attention. 7. Grow your network first: Well this should have been done the first and foremost. Grow your network. How do you grow? 8. Find out who on your GTalk, Yahoo Messenger or MSN Messenger may be on Linked In and add them up. 1. Some friends or blogs can give you a tip to update your LinkedIn “Status Update” mentioning that you are searching for a job. DON’T DO THAT!!. Remember, most of your bosses and fellow workers are already on LinkedIn and do you want them to know you are not pleased with your current company and want to move out? You decide!! 2. Do not try to contact people in LinkedIn mentioning about your friend who is their first degree contact unless you get an approval from your friend. The list is endless. Your network can grow as much as your mind can think. And there is no limit to your thoughts. LinkedIn has introduced several new updates to their site recently, including the "Company Follow" tool, another that matches users to job openings and a number of new sharing options. But if you're looking to add a bit of pizzazz to your profile, or hope to catch the eye of a hiring manager, consider exploring LinkedIn's Applications. These add-ons make your profile dynamic and interesting, says Nathan Kievman, owner of the LinkedIn group Linked Strategies and host of weekly LinkedIn webinars. "Profiles [can be] otherwise boring and static without applications," he says. Kievman recommends that every LinkedIn user should add at least one application to their profile--he suggests Amazon's reading list--, but keep the total to no more than five to avoid cluttering your space. To access LinkedIn's applications, select "More..." from LinkedIn's navigation bar and choose "Application Directory." Note that for each application you choose, you're able to control the privacy settings, so be sure you update them appropriately. Here's a look at five applications worth exploring. With Amazon's Reading List application, you use a search tool to build a collection of books you're planning to read, are reading right now and have read. You have three lists of books you can view with this application: one from people in your network, one from connections in your industry and one detailing updates from across LinkedIn. If you like a particular person's reading list, you can follow it. Likewise, others can follow your reading list. This application is great for discovering books recommended by people in your field, as well as finding out which books should be on your radar. 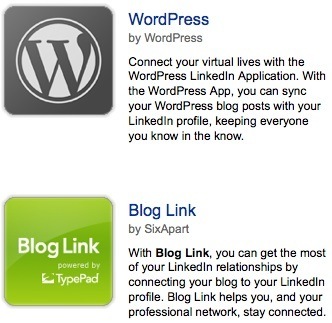 If you maintain a blog on WordPress, this application synchs your posts automatically with your LinkedIn profile. This app displays your avatar and also lets you filter your posts--if you don't want to share every entry with your LinkedIn connections--by using a special LinkedIn tag. As with sharing your tweets on LinkedIn, be wary of which posts you share and how often you do it. If you have a SlideShare.net account, you can post your presentations and documents directly to your LinkedIn profile to share with your connections. (You can also sign up for an account via LinkedIn's website). With this app, you can view "Featured" presentations, search webinars and click through the most downloaded presentations. You can also check out a list of the presentations that your connections have uploaded. The Events application, via a box that's added to your profile, shows what events people your network are attending and helps you find events recommended for you based on your industry and job function. You can also view the most popular events, search for events and create new ones. This application is great for making connections prior to attending a conference, or following up. The Company Buzz tool aggregates mentions of a company from Twitter, helping you discover relevant trends and comments about your current employer or a target employer. You can customize and modify the topics to watch, monitor trends and display charts that track activity. A common misconception of Social Media sites is that you have to spend a lot of time to get anything out of them. But according to some contract recruiters we’ve spoken to, you can really get a lot of value for a very small investment of time. According to Mike McDonough of General Search and Recruitment, spending as little as 30 minutes every other day on the site is more than enough. In fact, just 30 minutes in LinkedIn resulted in one particularly lucrative placement for McDonough. He mentioned to a newer client that he was able to do contract placements. The client eventually grew to the point that they needed contract help and turned to McDonough. Once he had the job order, he used the Advance Search feature of LinkedIn to look for people with specific skills in the insurance industry and within a specific zip code area. He then used the InMail feature to contact seven people who had relevant experience, asking if they or someone they knew might be interested in a contract assignment. Five people contacted him back, and one ended up being the person he placed. He had the candidate on contract for five months and then converted the position to a direct placement. Schedule time to spend on LinkedIn, but not too much time. Again, he only recommends spending 30 minutes every other day. Join Groups – That’s where the best candidates are. Activate saved searches within LinkedIn. This will yield 15-20 candidates per day. Don’t let your LinkedIn time take up phone time. Whether you just created your first blog, or you are considered one of the top bloggers in the world like Darren Rowse, Chris Brogan, or Tim Ferriss, you are always looking for ways to generate more traffic to your site. Even more so, you are looking for qualified traffic to your site, (i.e people who are interested in the content you produce). For you Twitter lovers out there, this should be an easy step to take. LinkedIn also has a status update feature that is a lot like Twitter, only it gives you 148 characters to work with instead of 140. Why is it so important to constantly update your status? Because it is the first thing that pops up the home profile for all of your connections. Check out your home page on LinkedIn and you will see a few status updates of those your are connected to. If they are smart, they will include some compelling copy with a call to action and a link back to their blog (something I do that drives traffic to mine). Some of these niche groups have thousands of members who are actively involved in connect with other members. If you are not in the groups where your audience for your blog is hanging out, then you are missing out on the opportunity for new readers, and organic traffic to your site. Join as many groups as you can after doing a key word search that relates to your blog. For starters – check out the Professional Bloggers Group. This may be one of the most powerful things you can do on LinkedIn. I won’t go into all of the amazing details on how this has helped me, but I will tell you that owning a group drives a lot of traffic to your site. I own several niche related groups on LinkedIn. 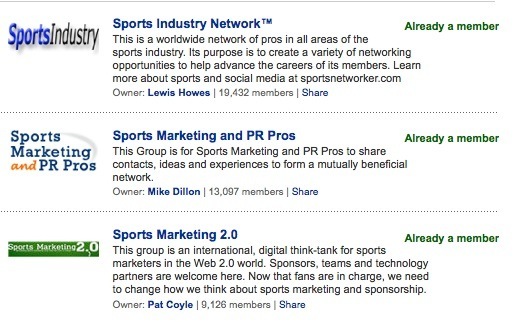 For example, I created the Sports Industry Network group on LinkedIn and there are currently over 19,500 members. When a new person joins the group, they see a brief description of the group, my name as the owner of the group, plus my website url www.sportsnetworker.com. Since my group gets over 100 new members each week, that’s additional traffic from new members alone. That’s not even including the close to 20,000 members who are actively engaging in the group, and clicking on my blog links. LinkedIn continues to be one of the top sites that drives traffic to my blog, thanks to these 10 examples, but the power of LinkedIn doesn’t stop here. What other tips have you found through using LinkedIn to increase traffic to your blog? Establishing a blog is a good step to enhancing your visibility as an expert in your field. Can social media rescue your career? ‘I’m in a Job Search–Now What? ?